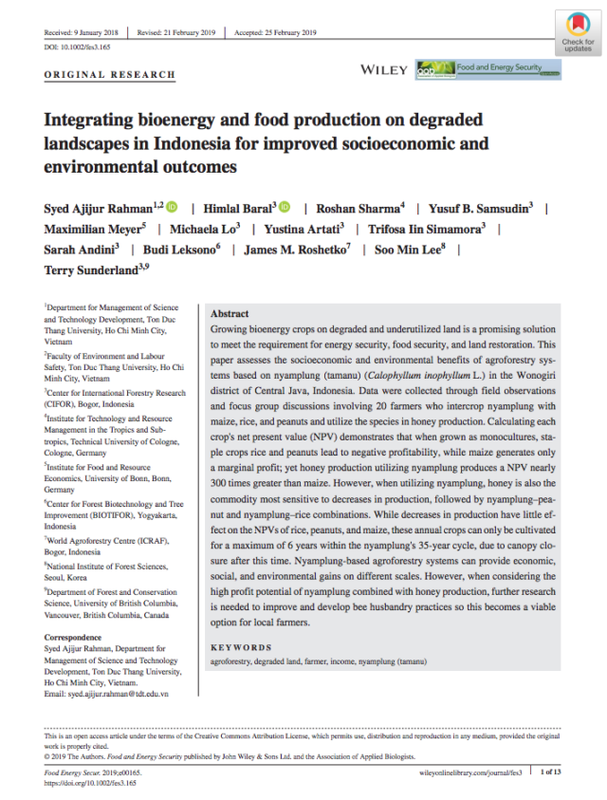 Growing bioenergy crops on degraded and underutilized land is a promising solution to meet the requirement for energy security, food security, and land restoration. This paper assesses the socioeconomic and environmental benefits of agroforestry systems based on nyamplung (tamanu) (Calophyllum inophyllum L.) in the Wonogiri district of Central Java, Indonesia. Data were collected through field observations and focus group discussions involving 20 farmers who intercrop nyamplung with maize, rice, and peanuts and utilize the species in honey production. Calculating each crop’s net present value (NPV) demonstrates that when grown as monocultures, staple crops rice and peanuts lead to negative profitability, while maize generates only a marginal profit; yet honey production utilizing nyamplung produces a NPV nearly 300 times greater than maize. However, when utilizing nyamplung, honey is also the commodity most sensitive to decreases in production, followed by nyamplung peanut and nyamplung rice combinations. While decreases in production have little effect on the NPVs of rice, peanuts, and maize, these annual crops can only be cultivated for a maximum of 6 years within the nyamplung’s 35-year cycle, due to canopy closure after this time. Nyamplung-based agroforestry systems can provide economic, social, and environmental gains on different scales. However, when considering the high profit potential of nyamplung combined with honey production, further research is needed to improve and develop bee husbandry practices so this becomes a viable option for local farmers. Author(s): Rahman, S.A.; Baral, H.; Sharma, R.; Samsudin, Y.B. ; Meyer, M.; Lo, M.; Artati, Y.; Simamora, T.I. ; Andini, S.; Leksono, B.; Roshetko, J.M. ; Lee, S.M. ; Sunderland, T.C.H.